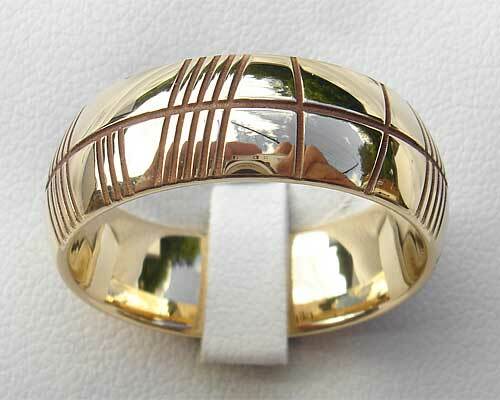 Men's Gold Ogham Ring : LOVE2HAVE in the UK! Here is one of our lovely men's Ogham rings made from 9ct yellow gold that can be personalised with your very own choice of Ogham engraving. The Ogham is created using laser technology which has a far greater definition than an engraving done by hand. The ring is a classic dome shape and is 8mm wide. It is also available with a satin finish, polished finish pictured. A 6mm width and 4mm width are also available allowing you the option to purchase these rings as matching wedding sets. These rings make brilliant personalised and matching wedding rings. You can decide just what you want in Ogham on your ring, and we will translate it for you (up to 15 characters). The personalised Ogham engraving included in the price is FREE! Just enter your requirements into the comments box at check out. If you want an idea of how your Ogham will look and are not sure, then try visiting this website to see what your engraving looks like in Ogham. Returns Policy: This UK made Ogham ring is personalised and made to order so, therefore, non-returnable unless faulty or not as described. Please see our terms and conditions.